Author Presents A True-blooded American At The Miami Book Fair 2018! AuthorCentrix celebrates its second year as one of the exhibitors at the Fair. The company will be gracing the event with Bill Terrain, a true-blooded American. This year at the Fair, he brings to the readers, an autobiography entitled Preserve, Protect, and Defend the Constition: Written By An Old American that captures the interest and attention of every straight-thinking American. A chance for one-to-one Author Interview and Book Signing with Terrel await everyone! Optimism is the faith that leads to achievement. 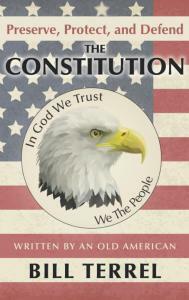 In Terrel’s piece of work, Preserve, Protect, and Defend the Constition: Written By An Old American, every American will be awakened by the words of a conservative Republican who never stopped believing in his country and its capability to regain its principles that seemed to have been overshadowed by the worldly resources. Issues on how leaders are accountable for leading the nation, bad policies of the Obama administration and details delivered by the media are revealed. The book offers an autobiography and part political opinion essay – an eye-opener to every American citizen who cares about the future of the United States of America.